Sleep in style with the eve bed frame. We’ve combined premium Italian wool-blend upholstery with solid ash tapered legs to create a high quality, contemporary bedstead. It’s designed for easy assembly and comes in four stylish colours. The bed frame was designed in London and manufactured in Poland. Wool-blend fabric, made in Italy. Particle board / MDF with pine rail construction and PU foam cushioning. 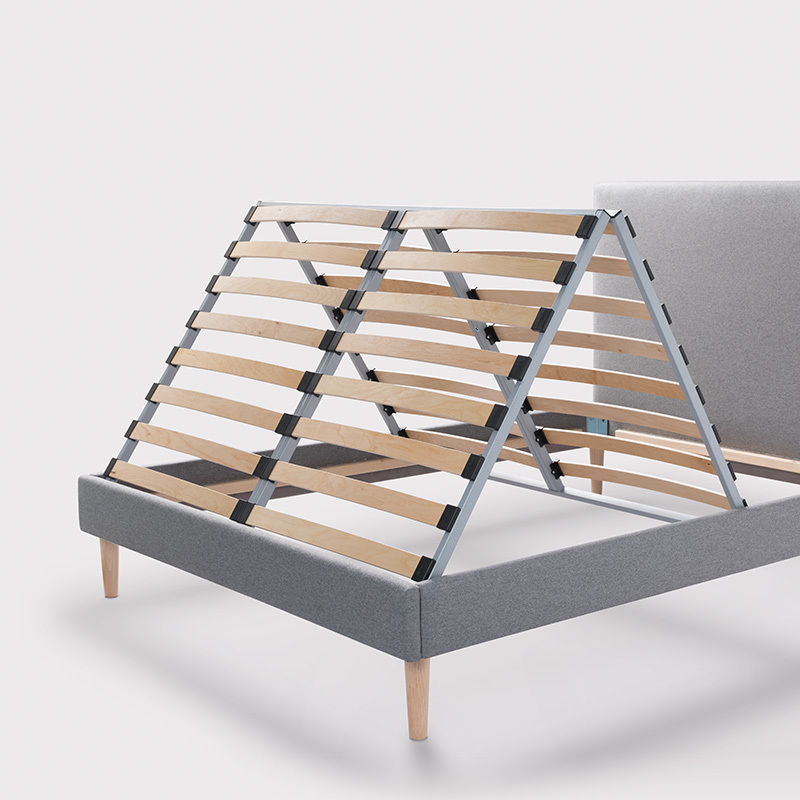 The eve bed frame has 16 slats spaced 7cm apart. The feet are crafted from solid ash and finished with a matt lacquer. All eve upholstered furniture and furnishings comply with the requirements of the UK Furniture & Furnishings (Fire) (Safety) Regulations (1988 - as amended). From the subtle, neutral tones of grey and oat to a bolder charcoal and navy, the bed frame comes in a choice of four colours and an optional headboard - so you can find the perfect fit for your bedroom. The slim sides and solid ash tapered legs add a contemporary finish. And with 19cm clearance under the bed, there’s plenty of space to store any clutter. We carefully selected each element of the bed frame to make sure it’s the best possible quality and stands strong for a lot longer than 40 winks. The frame is upholstered in a super soft, premium Italian wool-blend; and we’ve cushioned the headboard with foam for extra comfort. For long-lasting style and additional support, the frame has a solid construction and has sprung beech slats. We’ve also made the slats slightly arched. This gives a little extra spring and allows air flow, so your mattress can breathe easy - and last longer. Nobody enjoys impossible-to-read instructions and endless pieces, so we made the frame all about the easy assembly. It’s got prefixed nuts and bolts and preassembled slats that slot straight into place; and one small spanner is all you need to put the bed frame together. Which, naturally, we give you. With around half the build time of competitors, you’ll be tucked up in bed before you know it. Our efficient two-man delivery service will deliver the bed frame straight to a room of your choice, ready for you to assemble - for free. The delivery crew will text you to book your delivery day in advance. Once they are on the way they will call you, usually about 30 minutes before they arrive at your home. If you want to return the bed frame, you have a 30-day return policy. The bed frame must be returned unused and in the original packaging. Sleep easy with a 5 year warranty. This means we’ll guarantee your bed against faults or breakages for a maximum of 5 years. Just remember to file your proof of purchase somewhere you can find it. Not sure what colour to choose? Not a problem. You can contact our customer service team and ask for a fabric swatch, so you know exactly what colour bed frame suits your sleep space. Purchased the Eve super king bed frame about a month ago in charcoal. Really impressed with the quality of this bed and so easy to assemble. Even comes with its own spanner and a little pocket to store it in. The design of the bed is very slim so as to not add additional bulk. I wouldn’t ... hesitate to recommend this to anyone. Simply superb. Eve bed frame and mattress. Plus other Eve products. Extremely pleased with the eve bed frame, it is very stylish and the eve mattress is very comfortable. I have really noticed a difference. It has really helped with my back pain. We have gone on to purchase the Eve duvet and pillows. My son also has an Eve mattress for his bed. The ... mattress protector is great too. He thinks it’s so comfortable. Excellent products. Highly rate and recommend them. Thank you Eve! The Eve bed frame is not only extremely easy to assemble (took 30 mins on my own, thanks to easy to read manual and handy tools provided by Eve) but is sturdy and very contemporary looking. Love the little pouch in the headboard to put the important spanner so you don’t lose it ... for future use. I chose oat as my room is neutral but I can imagine it would work with any colour scheme. The slats fit with no issues into the frame and you can see that this frame is made to make life easy for you. Best night’s sleep I’ve had in a long time with the Eve original mattress on it. Can’t recommend Eve bed frames enough, for anyone in two minds about buying one, no hesitation needed, just do it - you won’t be disappointed. The eve mattress and bed are wonderful. I have had the best nights sleep since owning an eve mattress and bed! Highly recommend the eve mattress and bed frame. I wish I had bought one sooner! I recently purchased the Eve Double Mattress and Bed Frame. I was a bit nervous about whether or not I had made the right choice until my first nights sleep. The mattress supports your body and sleeping position and I can honestly say its the best mattress I have ever owned. Would ... 100% recommend the Eve Mattress and bed frame. The Bed Frame is really easy to put together and takes less than 30 minutes to assemble. Find the ideal partners for your bed frame with the rest of our perfect start system.